I love passion fruit! Ever since I discovered it about 15 years ago it has been my absolute favorite fruit! It is perfect in desserts combined with mangoes or enjoyed just as it is! This cake is one of the first cakes I ever created! More than 7 years ago, it is mostly thanks to this cake that I fell in love with raw foods and that way of baking and cooking. This cake becomes a favorite to everyone who taste it! It is incredibly fresh. Sweet and sour with tropical flavors of mango and passion fruit! Enjoy! Prepare by soaking 3 cups of cashews for 4 hours (420g). Time: 1 h + 4 h in the freezer. 12-14 servings, use a 20 cm spring form. 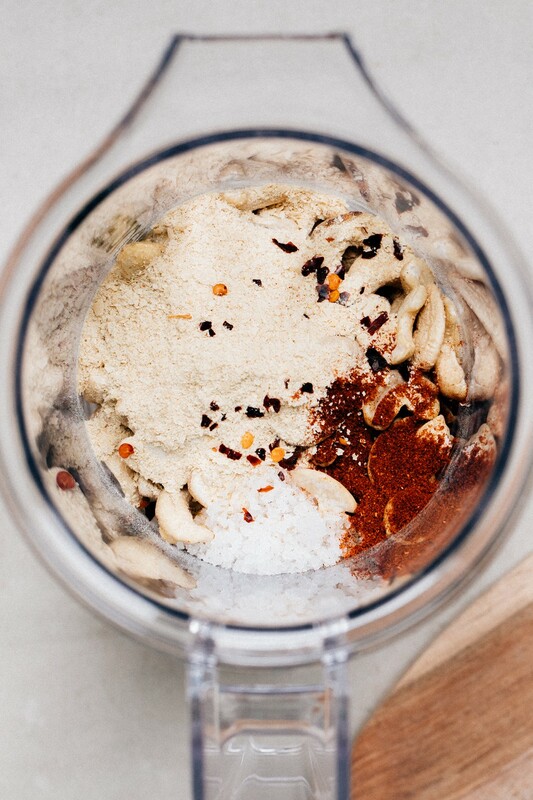 The crust: Mix all ingredients in a food processor, start by mixing nuts and coconut flakes until it becomes a roughly chopped blend. Add all remaining ingredients (except buckwheat) and mix until it becomes a firm dough. Mix in buckwheat by hand form a crust in the bottom of a 20 cm spring form. The cheesecake filling: Mix all ingredients in a blender (except coconut oil) until it is really smooth. Add the coconut oil in liquid form in the end and mix for a few more seconds. Pour the mixture on top of the spring form. Place the cake in the freezer while you prepare the topping. Mango & Passion fruit topping: Mix the defrosted or fresh mango pieces into a completely smooth "sauce". Add 1 tablespoon of liquid coconut oil. Add the passion fruit seeds (without blending!!) mix with a spoon and spread the topping evenly over the cheesecake layer. Place the cake in the freezer for 4 hours. Remove the cake from the freezer and let it sit at room temperature for 5 minutes, before loosening it from the edges of the spring form. Let it sit in the refrigerator or at room temperature for a while. Serve and enjoy! Oh my! What a heavenly breakfast! This is really my favorite thing to do! A big super yummy selection of healthy breakfast items with lots of different flavors and textures. The sun returned to Stockholm today! I really hope that it is here to stay! To really boost that summer feeling I prepared some ice cold strawberry mojito infused water.